Manufacturer of a wide range of products which include rubber diaphragm. We are well known enterprise engaged in manufacturing and supplying highly viable Rubber Diaphragm. 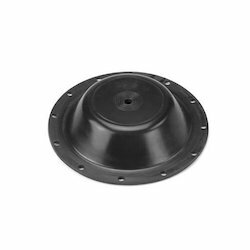 Our offered diaphragms are designed with varied range of fabric insertion techniques which includes qualitative grades of nylon, cotton and Kevlar. We are manufacturing excellent quality diaphragm with assurance of strict adherence to client specifications and industrial norms. Further, our prestigious clients can order the widely demanded diaphragms from us with 20MM to 1000 MM diameter at a nominal price. Looking for Rubber Diaphragm ?